I bought Jazzi at the 2015 AKGA Showcase Sale and just had to have her! I could see that she could be the perfect doe for our ranch and she hasn't disappointed. With Blues Son and Iron Horse in her background, she is a beautiful blue goat. In 2016, we did an embryo flush with Jazzi and Sunboy Rotan 150 (Magnum) sperm. We implanted three does and ended up with two sets of twins and a set of triplets. We also ended up with "Magnum Surprise" from Jazzi! Although she had been given a shot to ensure she was not left with viable embryos. We found Surprise following Jazzi the day after the embryo recipients kidded. 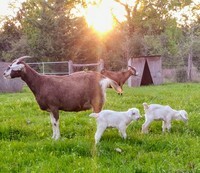 She the day-old doeling in the picture. Jazzi has proven to be a leader in the doe herd. She has developed into a muscular, study doe yet very feminine and motherly. Through hurricanes and droughts in Central Texas, Jazzi has maintained great body condition and low Famacha scores. Steel and his litter mate SEV Magnum Onyx were our first embryo transfer kids. We decided to retain him to use in our New Zealand breeding program after seeing how well he's maintained a low famacha without frequent de-wormings. This is the first year that we will be collecting consistent data on him.